Internally displaced persons (IDPs) line up early in the morning for a general food distribution at the UN Protection of Civilians Site, Malakal, South Sudan. “These violations by the parties and the continuing hostile propaganda undertaken against one another are worrisome, as they illustrate a lack of genuine commitment to honour their words, and de-facto undermine the regional and international efforts to revitalize the peace process,” Under-Secretary-General for Peacekeeping Operations Jean-Pierre Lacroix told a Security Council briefing. The world’s youngest country has spent much of its short life mired in conflict, as what began as a political face-off between President Salva Kiir and his then former Vice-President Riek Machar, erupted into full-blown war late in 2013. The Agreement on the Cessation of Hostilities, Protection of Civilians and Humanitarian Access among the warring South Sudanese parties was brokered by the Intergovernmental Authority on Development (IGAD), an eight-country trade bloc in Africa. “The South Sudanese parties must realize that the international community and the region will not continue to tolerate Agreements being signed, only to be violated in total impunity,” he said, urging 15 Council members to speak out very clearly against these violations, and to take the decisive actions necessary to impose real consequences for the violators. IGAD’s High-Level Revitalization Forum is expected to resume on 5 February in Addis Ababa, Ethiopia, to focus on governance, transitional security arrangements and the permanent ceasefire. “It will be crucial for the South Sudanese parties to participate in the Forum in good faith and with a view to make the necessary compromises required for South Sudan to return on the path to a sustainable peace,” Mr. Lacroix said. On the security situation in and around Juba, he expressed concern over the attacks by unknown armed elements on Government security installations on 4 January. The same day, there were also shooting incidents between security forces and criminal elements near the ‘protection of civilians’ sites adjacent to the headquarters of the UN Mission in South Sudan (UNMISS) in Juba. UNMISS immediately reinforced those sites with additional uniformed personnel to prevent any entry. During the reporting period, inter-communal violence also escalated in the Jonglei, Lakes and Warrap areas, causing roughly 160 fatalities, including at least 24 women. UNMISS reacted swiftly to these incidents by mobilizing community leaders and peace actors to de-escalate inter-communal tensions, and promote dialogue and reconciliation. UNMISS will formally inaugurate a new base in Yei in Central Equatoria on Thursday. This base will allow the UNMISS force to project presence, to build confidence and restore stability to an area which has witnessed an exodus of the population to Uganda as a result of recent conflict. Turning to human rights, he warned that the gravity of conflict-related sexual violence is deplorable and constitutes an emergency in its own right. In 2017, there were 2,670 incidents of sexual and gender-based violence, including conflict- related incidents perpetrated by both State and non-State actors. Unfortunately, these human rights violations are compounded by impunity, with perpetrators not being held to account, he said, calling on President Silva Kiir to end this impunity. Also addressing the Council was Ursula Mueller, Assistant Secretary-General and Deputy UN Emergency Relief Coordinator, who noted that the 2018 Humanitarian Response Plan for South Sudan seeks to assist six million people, more than half the population, and requires $1.7 billion. Some 1.5 million people are in emergency-level food insecurity, just one step away from famine, and around 20,000 people are already in famine conditions, she said, warning that the next lean season, which begins in March, is likely to see food security worsen, and could see famine conditions spread to several new locations across the country. Access challenges have continued to delay and interrupt the humanitarian response. Last month, in Unity state, truck drivers delivering humanitarian supplies by road from Juba reported a total of 66 checkpoints, she said. In 2017, at least 28 aid workers were killed in the line of duty, and over 1,100 incidents were reported, the highest annual count since the conflict started in 2013. 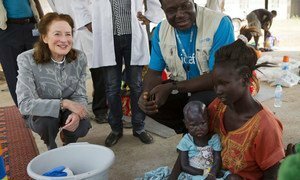 Following a two-day visit to conflict-ravaged South Sudan, where a quarter of a million children are severely malnourished and at imminent risk of death, the head of the United Nations children's agency has said only an end to hostilities can bring back hope and safety to the children and young people there.